I have made this recipe a few times already. I’m going to let the cat out of the bag here….it’s a Hit! It is the perfect sized delicious Turkey meatloaf, IMHO, and incorporates good greens for the little “no green things” dude in the house. The best part about them is that these little loaves freeze so well. This is the kind of recipe that will take you under an hour to prepare a bunch of them that you can then pop in the freezer for a quick dinner in the future. You only have to remember to defrost them a few hours before, and have some tomato sauce on hand to cook them up with. Easy Peasy I promise. Italian Seasoning. Mix of Thyme, Oregano, dried Basil etc. A mini loaf baking pan. 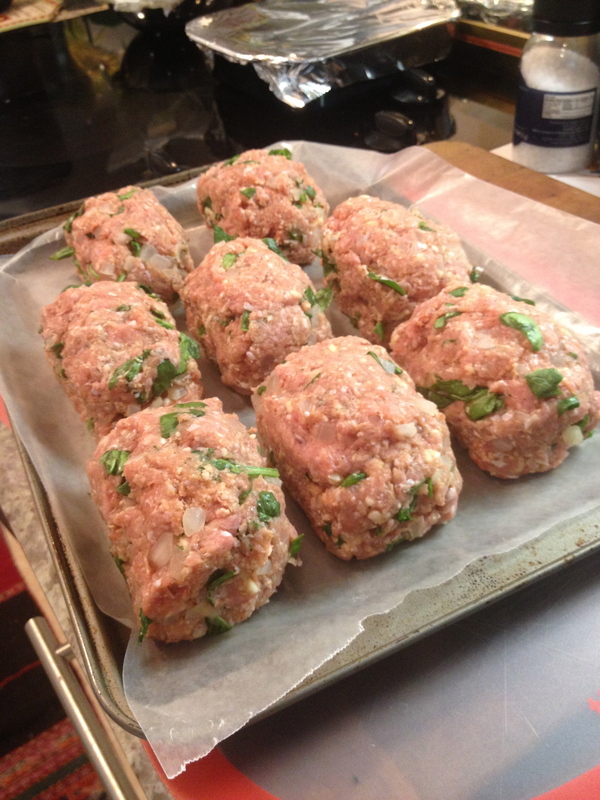 You can absolutely free form these with no problems, I just love the look of the mini meatloaf in the actual shape of a loaf. That and I have a mini loaf pan already. Take your onion and cut half of it to use. Mince up the onion in very small pieces. 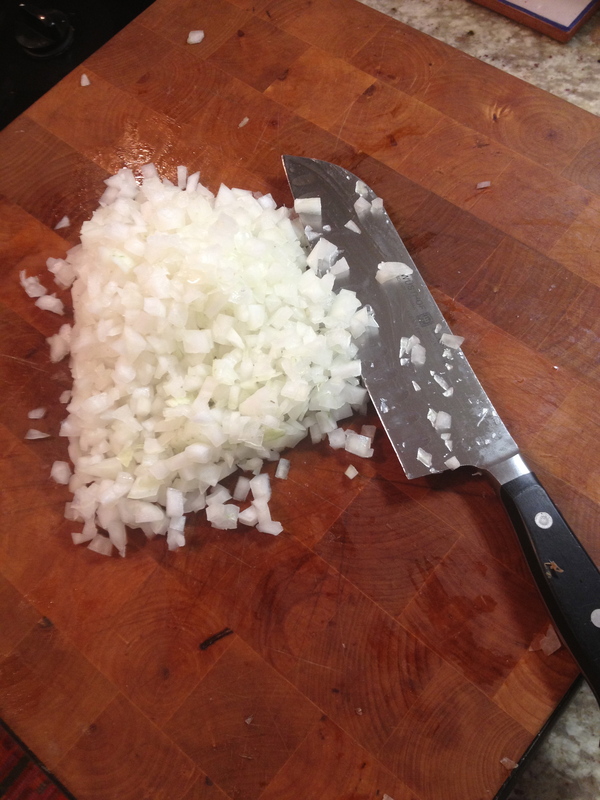 I am totally OCD about minced onions, I hate when onions are to large and chunky in a recipe like this one. 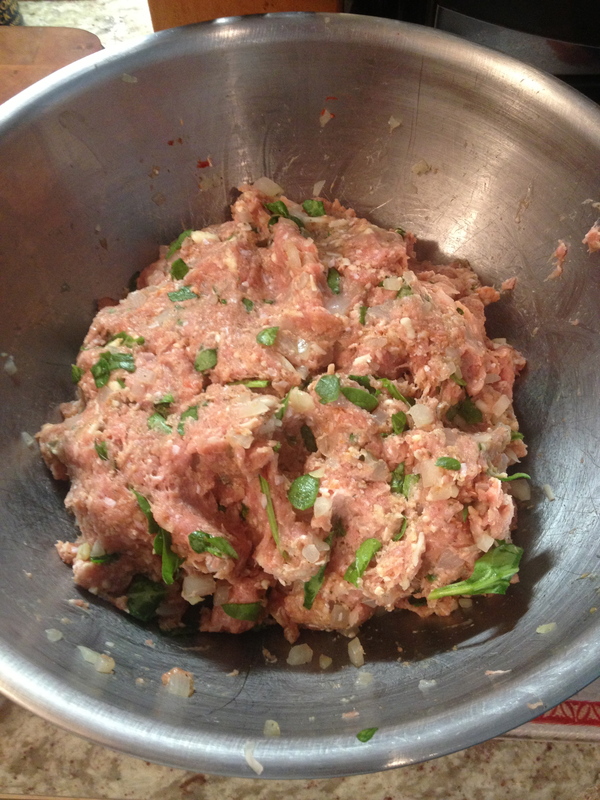 If you are using fresh garlic mince up about 4 cloves of that as well to mix in with the onions. Next I give the onions and garlic a bit of a sauté in some olive oil. Med to low heat. You want them to caramelize not brown or overcook. When they are soft, slightly translucent and smell heavenly, remove from heat and let them chill. You don’t want to put them in the turkey mix hot. Put the ground turkey in a large mixing bowl. I like to let it sit out while the onions are being chopped and cooking so it isn’t ice cold when you mix it up. Why? Because you do it by hand of course! I apologize that I don’t have any photos of the next steps until it is all mixed. 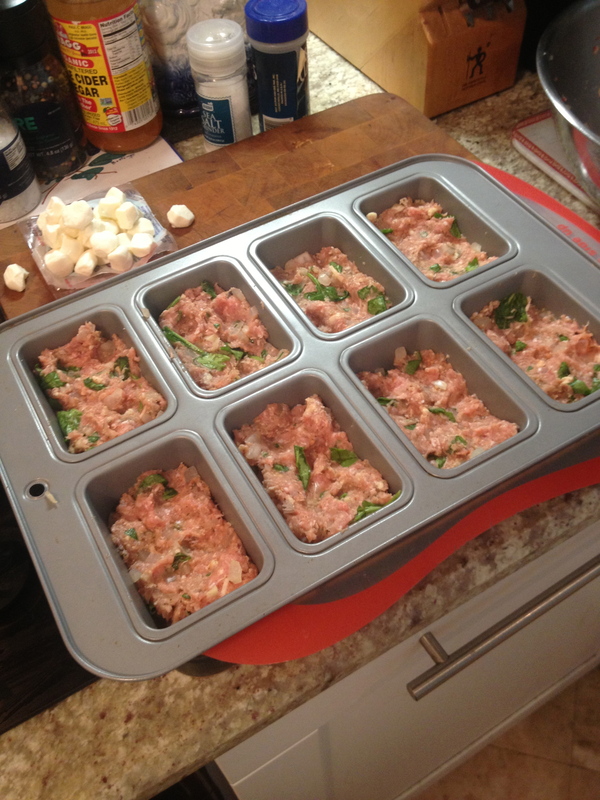 I also don’t have exact measurements …again. My bad. 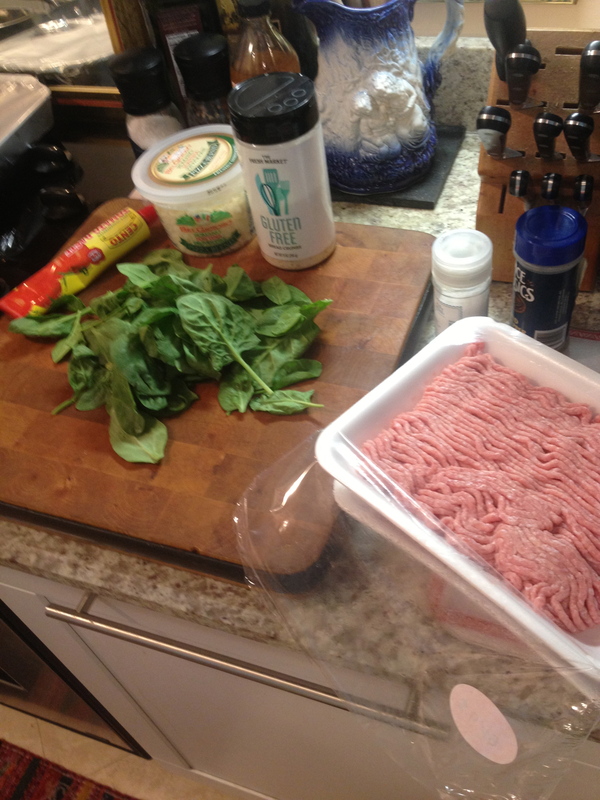 Take about 2 handfuls of spinach and a few basil leaves and chop it up really well so the pieces are small. Put it in the bowl with the turkey. Add the cooked onions and garlic that have cooled, about 3 – 4 tbsp of tomato paste (a good healthy squeeze from the tube), at least a 1/2 cup of the gluten free breadcrumbs, about a 1/2 cup of the shredded cheese mix. I use BelGioioso mixed shredded cheese. Finally add about 1 tbsp (more if you like) of Italian seasoning and S & P to taste. Then after you give your hands a good scrubbing get them in there and mix it up! When it is all well combined it should look something like this. I then get out my mini loaf pan – which was actually the inspiration for this recipe one fine day – and fill each about 2 /3 up with the mix. There are only 8 in the pan so your option is to do another batch for the remaining few – anywhere from 2 – 4 more depending on the size you make – or you can free from them. Thats up to you. Now you can see in the photo the Boccacini Mozzarella in the background, take 3 – 4 of them and put them in each loaf, I do it in a line down the middle. 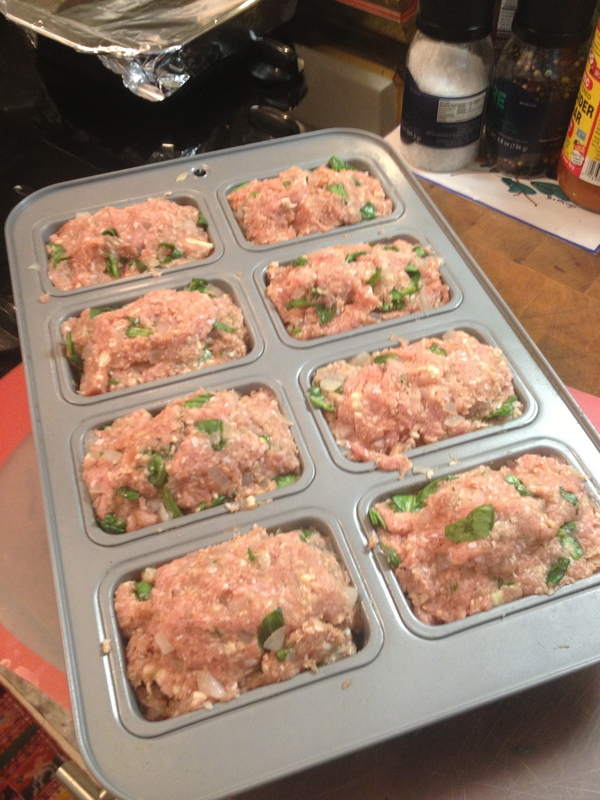 Then top each one with more of the turkey mix and make little loaves. The first time I made these I got to this point and then thought. “Oh damn, I’m not cooking them in this pan, how do I get them out?” Luckily it’s not that difficult. Get a fork and loosen the sides, put it down one side and push each one out. They will not remain in perfect shape but that’s ok, you just re-shape them. So now you have the option of cooking some or all or freezing them. If you are cooking them, put them in a glass baking dish, cover them with your favorite Tomato sauce, home made or store bought – no judgement – and bake at 350° for about 25 – 30 minutes. You don’t want to over cook them and dry them out, although the cheese in the center, and the sauce covering it pretty much ensures moist and tender meat loaf. For freezing, do NOT cook them first. Freeze them raw. 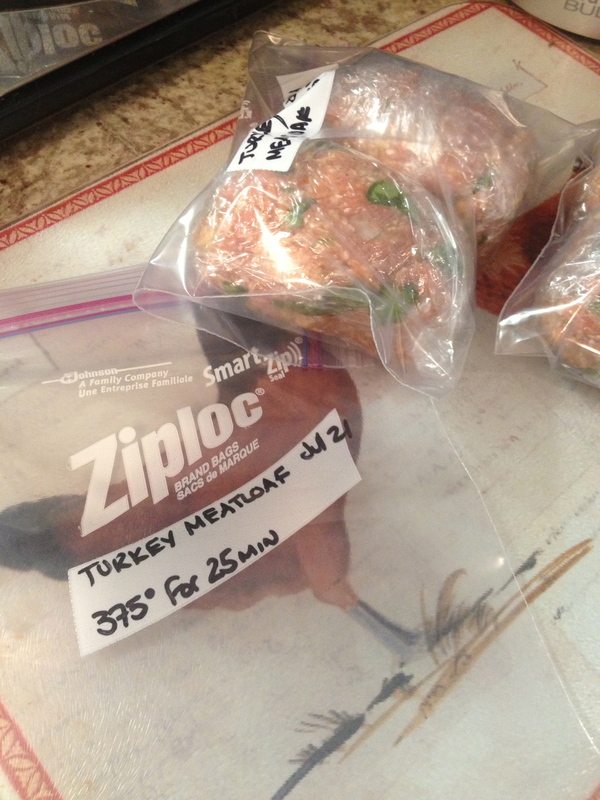 Wrap each one well in saran wrap, double layer and then put in a ziplock freezer bag. I then mark the bags with the date I made them. A little OCD perhaps, but things get lost in our freezer and I like to have an idea of how long something has been in there. There you go. I told you that was easy right? Take them out of the freezer a few hours before you want to serve them, again cover with your favorite tomato sauce and bake. If they are still a bit frozen up the oven to 375° for 25 – 30 minutes. Serve with pasta, salad, veggies, whatever you like. Littledude eats an entire loaf himself and Ladybug is gets pretty close to polishing one off as well. Littledude generally wants seconds. I tried this recipe. It was easy and fun to make. It was a huge hit with everyone that tried it. I shared the pictures I took of the dish with my coworkers and they all asked for the recipe. The portions are right and if you freeze them they take only 20 minutes or so to cook after getting home from a long day at work . I give this a big happy thumbs up!